I’ve been on another cleaning tear lately, either because it’s spring or because it simply distracts my mind from bigger thoughts. I suppose either is a valid excuse, really. This weekend I opened up a box that’s been sitting around for a while. Hell, I’ve probably carried it through my last two moves. Inside was a random collection of stuff, most of which was so old and outdated (“have I really been hauling around that newspaper clipping for all these years?”) that it was pretty easy to throw most of it away or in recycling. 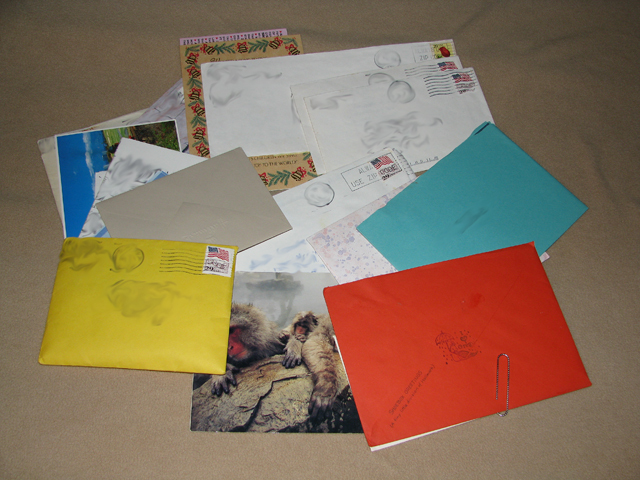 Neatly folded and organized, and carefully stored in a plastic bag, was this pile of letters. Old correspondence from my early college years, just before everyone started shifting to e-mailing on old UNIX servers. They’re letters from high school friends, sent to a homesick lad in his first couple of years living in San Francisco. Some are from random high school friends I lost touch with a long time ago. Others are from the girl I briefly dated at the end of high school, who would later dump me for one of the friends in our group. Still others were from a close high school friend who became born-again and who would later, after six years of knowing each other, end our friendship because, as a single man, I represented a “threat” to the good Christian marriage she was about to enter in to. A “threat to her marriage.” That’s a heck of a charge to level against a late-bloomer of a twenty-year-old, you have to admit. Especially after six years of friendship and attending different colleges two hundred miles apart. Still makes for an interesting story two decades later, though. I haven’t read the letters yet. Apart from taking them out of the bag and spreading them out for the photograph above, I haven’t done anything with them, really. Mostly they just sit on my coffee table and I stare at them every so often. They’re almost twenty years old, written correspondence of a life and social structure that feels a very long time ago. Part of me has a nostalgic vibe and wants to keep them. They are, after all, memories and reminders of who I was and what was going on in my life in those days. Another part of me wants to take them on my next camping trip, read them one last time, and throw them into the campfire. The past is the past, after all. For the moment, though, there they sit, on the coffee table, still neatly folded and organized in their plastic bag. The one I’ve been hauling around, apparently, for a score of years now. So long that I’d even forgotten of their existence yet, now that I’ve rediscovered them, find myself unsure of whether or not to part with them. Keep or burn? What would you do? I’d keep them. Think of it as a Journal of sorts; a reminder of the past. There’s nothing wrong with an occasional nostalgic episode, as long as you’re not living in the past. I vote keep. If you periodically go thru the sentimental stuff and purge (like you are now) then what will emerge is a small collection of memorabilia that can be shared with a future spouse, children or grandchildren. They will appreciate the opportunity to get to know the GH of before they knew you. cheers! I would read and and toss them. Even better.. just toss them. These letters are not from people who you are still in your life. Purge!!! As your friend for 6 yrs who decided you were a threat to her marriage, i think one of two things. First, she had feelings for you. Even though they may be feelings of deep friendship, she will compare you to her husband. Second, her husband saw you as at threat and asked her to end the friendship. She being a good Christian obeys (which i totally disagree with). I’m a keeper of these things. I have cards from people that are still in my life and people that I want to keep very far away only because that’s who I was back then and because I love to reminiscent on the post stamp price, the type of paper used; mostly though, because I can take any of those papers in my hands and get an instant flashback of me 10, 15 years ago and I like that. On the same note, I once collected every diary entry I did on a particular lad when I was 18 and burned it when I was about 24 and now I wish I could read some of them to remember what is it that I thought of him or what kind of time I had with him, I barely remember anything about dating him at all. And I want to remember about ME back then, it was my first “grown up” dating (hahaha), I must have been really funny in my reflections. I keep all the letters that have been sent to me. I have them all organized by author and my family’s instructions are should I die, return them to the original author. Then they will get a surprise glimpse into their younger selfs! I have a couple of friends who’ve saved all the letters I have written them. A few times we’ve done “swaps”, where we both get to read our own letters. Sometimes it’s embarassing, but almost always full of surprises and things you have forgotten. And on occassion, I part with letters earlier than my death. For example, for my cousin’s wedding, I gave him all the letters he wrote me when he was young. In one letter, he complained about moving to a new town. He despised the move then, but it was that very town where he met his future wife. Plus recently I got to go through the letters sent to my father while he was in college. Just priceless. Loved them! I’m in the keep camp, too. I have lots of old letters and it’s always fun to look back on them. Some things are a stark contrast to present day, some feel like they haven’t changed a bit. There’s something about having tangible correspondence, too. People need to write more letters nowadays. I’m a purger. The past is the past and that’s where it belongs. If the memories in the letters were that important, they’d still be fresh in your mind. Lighten the load for the next move and toss them. Read, weep (or smile/laugh), Facebook (those that you want to get back in touch with), and purge! Hm… I’d put them back in the box to rediscover in another twenty years time. Read everything and keep the most important letters to you. If you cannot choose, burn everything. As you said, the past is the past. a little late here (sorry). i say get rid of some and keep a few that are extra-special. i realize they may all seem special so it won’t be easy, but go with your instinct. i get a bit nostalgic and keep things like this, but about once a year i look through everything again, and get rid of a little more year by year. Read em. Take pics of the phrases or paragraphs that you want to keep. Then toss em. I’ve done that with articles or books i’m reading that i want to remember. Take a quick pic, then be done with it. The first thing that popped into my head was “Burn after Reading” … but then all those sentimental feelings would be stirred up and I’d want to keep them … LOL … I’ve told hubby to just throw out the box that has been moving with us since 1984! If I haven’t missed it now, I won’t miss it later. But the minute he makes me go through the box, I end up keeping everything in the dang thing!! what you have acquired right here, really like what you’re saying and the way in which you are saying it. some were announced earlier and other individuals were provided to Forex Magnates upon inquiry.